Strawberries and rhubarb are a classic combination for good reason. When strawberries are at their peak, their sweet flavour provides a fabulous counterpoint to the tart tanginess of rhubarb. Add in fluffy baked meringue, toasted almonds and a deliciously moist sponge cake and you’ve got a winner. 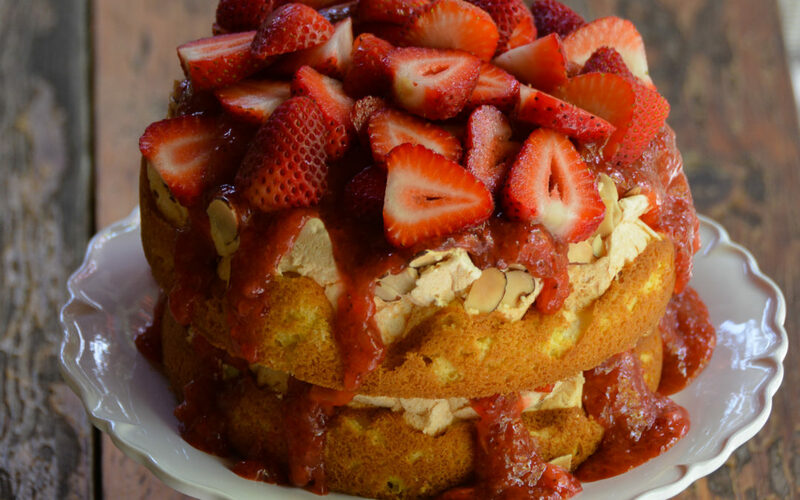 A tender moist cake layered with sweet, crunchy meringue, crisp almonds and a tangy strawberry-rhubarb filling. Delicious! 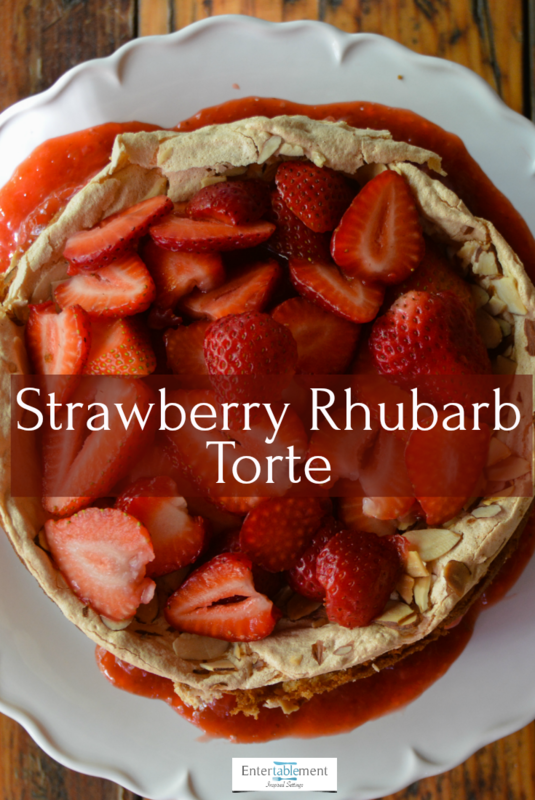 In a large, heavy saucepan, combine the rhubarb, strawberries, sugar, tapioca, and lemon juice. Stir well and let stand for about 15 minutes to soften the tapioca. Place the saucepan over medium heat and bring to a simmer, stirring often, until the mixture begins to thicken (about 5 minutes). Reduce the heat to low and cook, stirring occasionally, until the mixture is jamlike and has reduced to about 1 3/4 cups (about 30 minutes). Transfer to a bowl, let cool, cover, and then refrigerate until cold. Position a rack in the center of the oven and heat to 350°F or 325°F Convection. Generously butter two 8-inch round cake pans (springform if you have them), line the bottom with parchment, and then butter the parchment. In a small bowl, whisk the flour, baking powder, and a pinch of salt. In a small bowl, stir together the vanilla and milk. In the bowl of a stand mixer fitted with the whisk attachment, cream the butter and 1/2 cup of the sugar at high speed until light in color and texture, scraping down the bowl occasionally (about 5 minutes). Add the egg yolks one at a time, and beat at medium speed to incorporate. Scrape down the bowl and then beat at high speed until the mixture is bright yellow (about 2 minutes). Sift half of the flour mixture over the creamed butter; beat just until incorporated. Pour in the milk mixture; mix at low speed until just blended. Sift the remaining flour mixture on top and then beat just until incorporated. Do not overmix. Divide the batter between the two cake pans, smoothing the tops evenly with an offset spatula. In a clean stand-mixer bowl with a clean whisk attachment, beat the egg whites at medium speed until frothy (about 2 minutes). Gradually sprinkle in the remaining 3/4 cup sugar, scraping down the bowl as needed. Once all the sugar is added, beat the whites at high speed until glossy, medium peaks form (about 6 minutes). The meringue will look and feel quite dense. Divide the meringue between the cake pans and spread with the back of a spoon to cover most of the cake, but leaving about 1/2" from the edge of the pan uncovered; do not smooth the tops. Sprinkle the almonds over the meringue, and then bake until puffed and lightly browned (about 25 minutes). Let the layers cool in their pans on a rack; the tops will sink considerably. 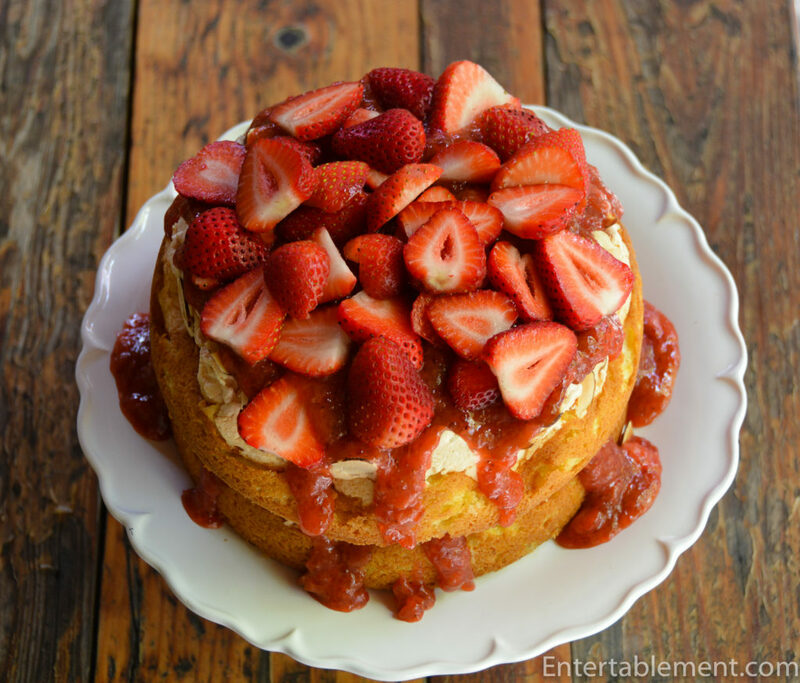 To serve, top with fresh strawberries, and slice gently with a serrated knife. The filling takes a while to cool, so leave lots of time for that; the actual assembly of the cake is quite quick. The meringue cake really puffs up while baking, and then subsides into hilly, crisp, chewy deliciousness while cooling. Springform pans are tall enough to contain the meringue at its highest. This looks fantastic Helen. Gerald LOVES the combination strawberry and Rhubarb. We will have to try it! Thank you for the step by step! Yum. Thanks, Gary! I made it about three times in two weeks; once for family and twice to take with me to dinner parties. It was a huge hit! I’m thinking of doing it with a lemon curd and fresh blueberries and/or blackberries. Please do! I always like to know how things turn out. Hope you and Gerland and well and set to enjoy a lovely long weekend. Happy Canada Day, Gary! Thanks for that recipe. We’re just finishing up a strawberry and rhubarb pie. One of our favourites. Will definitely make this. Happy Canada Day. Enjoy! I like the tapioca as a thickener. I’d never used it before and it leaves no chalky aftertaste;the jam is the perfect consistency. I had some leftover and used it on yoghurt for breakfast. Yum!